« Scrap your car for some spare Christmas cash! Scrap your Car or Trade it in? Some drivers part-exchange their car for a new one every year or two, others only when it breaks down, while some keep the same vehicle for many years, repairing it and tuning it up for as long as possible, until it is no longer economical to do so. If your car is fairly new, trading it in might be a no-brainer, as you’re likely to get a reasonable part-exchange deal in return, and save on buying an even newer vehicle. But it only takes a few years for the resale value of a vehicle to drop considerably, and as time goes by, the balance between trading it in and scrapping a car becomes a much closer comparison. So what are the arguments in favour of scrapping a car? If your car is not running, a lot of part-exchange deals won’t be available to you anyway, while for others you might be forced to tow or transport it to the sale room at your own expense. This is not the case when you scrap a car. J Davidson Scrap Metal have worked hard to offer the scrap car collection Manchester residents need when a vehicle is not running under its own power, or just when you want the convenience of not having to deliver it yourself. We collect many of the scrap cars Manchester households decide to get rid of, and are proud to provide a no-fuss scrap car collection service that will hopefully take the edge off of saying goodbye to your former pride and joy. At Davidsons scrap metal is recognised as a valuable material – once processed it is generally indistinguishable from virgin metal, yet uses much less energy to process and produce, which is good news for the environment too. 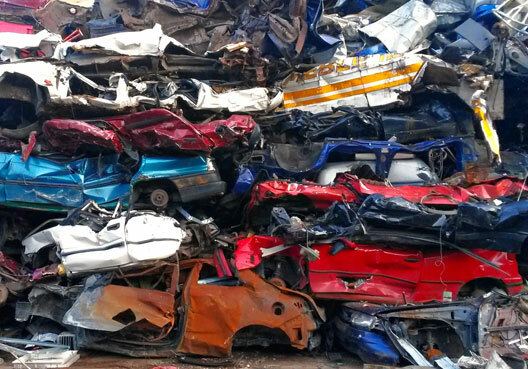 Protecting important finite resources like the different metals we commonly use in our daily lives should be a priority, and we make it a priority of our own that J Davidson Scrap Metal always offer the best prices for Manchester scrap cars and scrap metal in general. For older vehicles, as the value of the car drops – especially once it is no longer economically viable to repair – the intrinsic value of the materials it contains becomes much more significant, and at a certain point you will find scrap cars are worth more for their metal than for any second-hand or part-exchange deal you can get. Finally, although it won’t be your problem anymore, it’s worth giving some thought to what happens to the scrap cars Manchester residents send away for dismantling and recycling. A car contains potentially harmful fluids from engine oil to petrol, and even other liquids like screen wash detergents and antifreeze that should not be allowed to escape into the environment or contaminate water courses. When you scrap a car with Davidsons Scrap Metal, you can be confident that these fluids will be carefully collected and disposed of safely, while solid materials ranging from the scrap metal to the rubber on the tyres and trim will be segregated and processed in the most appropriate, economical and environmentally beneficial way. This article was posted in Scrapping your Car. Bookmark the permalink. Follow comments with the RSS feed for this post.Both comments and trackbacks are closed.